Opinion What would Jesus buy? We probably barbecue half of what we eat for dinner these summer days. A little while ago, I finally tossed the rusted-out splinter stick I’ve been using to flip burgers for years and went to Canadian Tire in search of a replacement. New spatulas range in price from $9.99 to $59.99 – like cable packages and phone plans, what you really need is bundled with lots of useless stuff. I Googled reviews, tested torque by turning over imaginary steaks, reflected whether a stained wood or stainless steel or stain-free rubber handle best conveyed what I want to tell family and friends about my grilling identity, and still, I couldn’t decide. I’ve been here before, sort of. Fourteen years ago, my wife and I, then newlyweds, had just moved into our first home, a one-room basement apartment in Boston. We were in graduate school and earning US$24,000 a year (combined). Back then, we struggled to decide how much money it was right – economically and ethically – to spend on a reading chair. In our defence, good seating matters a great deal to two people working on PhDs in English. Eventually, we spent US$20 on a yard-sale find that was far shabbier than chic. Today, if I wanted, I could spend triple that, on a spatula. I know, I know, this is a textbook example of a First World problem. But it’s more than that. It’s also a believer’s problem, or, more accurately, a bourgeois believer’s problem. The dilemma that bedevils me these days is not just what I should spend on something: It’s what I ought to spend. The New Testament offers many counsels, directly from Christ in the Gospels as well as from St. Paul in his letters to early Christian communities, that invite and challenge believers to be in the world but not of the world, and to love others as oneself. In turn, across two millenniums the Christian tradition has offered a variety of answers and models for doing so. Tithing, or donating a tenth of one’s funds to the poor, as the Bible proposes, is the most obvious and clearest option: Your pilgrim’s progress is quantitatively measurable. Far greyer is the call to reject worldly goods in order to create more space for God in one’s life and to contribute to a more equitable sharing of resources with others. Short of forsaking everything that glitters for God, also known as “the full St. Francis” – and not even Pope Francis, in his used Ford Focus and old black shoes, has gone so far as his famous namesake from Assisi – what’s an economically secure and ethically minded believer to do, especially in a dizzying period of extreme plenty and extreme poverty? Beside our current reading chair (more expensive than its predecessor, and far more chic than shabby), I have a copy of Thomas Piketty’s Capital in the Twenty-First Century, the most influential account of inequality to have been published in the past decade. It rests just underneath the Liturgy of the Hours, a centuries-old book of daily Christian prayer and meditation. I read both. I can be convinced by both to change how I live and behave and see what’s happening in this world. I’m also open to being persuaded by all the many kinds of polemics and statistics and graphs to be found elsewhere. Economic inequality, alongside the geopolitics of migration, is the most vexed and pressuring crisis of our time. Something needs to be done, at all levels of government and by all kinds of people, including me and you. But what, exactly? Two of the most distinctive efforts of late to answer that very question found unexpected side-by-side endorsements when the (former) president of the United States shared his summer reading list. The most striking juxtaposition Barack Obama offered was of conservative Catholic scholar Patrick Deneen’s much-discussed new book, Why Liberalism Failed, alongside progressive journalist Matthew Stewart’s news-making new essay for The Atlantic, “The 9.9 percent is the New American Aristocracy.” Both argue robustly for specific causes and sources of growing inequality: According to Mr. Deneen, it’s liberalism’s very success, its emergence as the exclusive socio-political-economic system of our era, with no forces to check or challenge its inherent expansiveness, that has led to its failure to extend its promised goods to all and points to its ultimate unsustainability. Amen, professor, but nobody around me can make a spatula, and to devote time and effort to figuring this out myself – something absolutely afforded by the economic, cultural and geographic privileges enjoyed by tenured First World professors such as me and Mr. Deneen – strikes me as leading, at best, to dropped burgers and a terrible memoir. At worst, it’s a decadent pantomime of the situation faced by what Oxford economist Paul Collier has termed “the bottom billion,” the extreme poor of the world today, those whose geographic and economic isolation means self-reliance and hyper-local exchange are their only, and very meagre, sources of subsistence. Meanwhile, in his Atlantic essay, Mr. Stewart declares: “The defining challenge of our time is to renew the promise of American democracy by reversing the calcifying effects of accelerating inequality.” According to Mr. Stewart, the primary source of inequality in the contemporary United States is the refusal of its top 9.9 per cent of income earners, including himself and most of his readers, to acknowledge that their ever-expanding forms of privilege and security come at the expense of the bottom 90 per cent of the population, never mind the dastardly 0.1 per cent at the very top. The essay offers abundant evidence in support of this argument, with a particular emphasis on the nearly caste-like effects of zip codes, schools and parentage, amounting to a statistical confirmation of the situations faced by millions of Americans of late, as recounted in books such as Amy Goldstein’s Janesville, Matthew Desmond’s Evicted and J.D. Vance’s Hillbilly Elegy. To emphasize just how unlikely the American Dream is in America these days, Mr. Stewart compares the state of inequality and prospects for bettering one’s prospects in Canada favourably with that of the United States, using the concept of Intergenerational Earnings Elasticity. Based on IGE measures, a child born to poor American parents will find it twice as hard to move past his parents’ economic position as compared with the prospects for a child born to poor Canadian parents. That being said, we should avoid our great national temptation. Don’t feel good and proud and superior and complacent because at least things are better here than down there. Indeed, as the recent studies gathered together by the Institute for Research on Public Policy in the collection Income Inequality: The Canadian Story suggest, just because economic stratification here is not happening as rapidly or dramatically doesn’t mean it’s not happening at all. That’s also why Mr. Stewart’s concluding recommendations can speak beyond his American context. He emphasizes that all levels of government have roles to play in turning back inequality, and that “It’s going to take something from each of us, too … We should be fighting for opportunities for other people’s children as if the future of our own children depended on it. It probably does.” Is ensuring that our own children’s futures remain secure really why we should care for others stuck in far less fortunate and far more fixed positions? If so, that’s ultimately just a more enlightened form of the virtuoso selfishness of the 9.9 per cent that Mr. Stewart so forcefully criticizes elsewhere in his essay. But, as a secular-progressive elite whose worldview is ordered by economic first principles, he can see no credible source of a higher calling to service and solidarity than, at best, conscientious self-interest, just as Mr. Deneen, a traditionalist conservative elite ordered by religious first principles, can offer no viable alternative to cracked and crumbling communities than to pursue earnest meta-monasticism in neighbourhoods where you and your fellow churchgoers build the gates yourself. In fact, many more of us can think and act for others by practising self-sacrifice, out of love and concern for those others, whether we know them or not. And more than any other religious believers, Christians have an especially dramatic example of self-sacrifice to follow, from someone who also predicted, correctly, that the poor will always be with us. That sense of a permanent need to help others, matched to the accompanying realism about the staying power of poverty, and inspired by a life of great love and personal sacrifice, should always animate an ordinary bourgeois believer’s daily life of seemingly endless abundance, in the aisles of Canadian Tire and elsewhere. 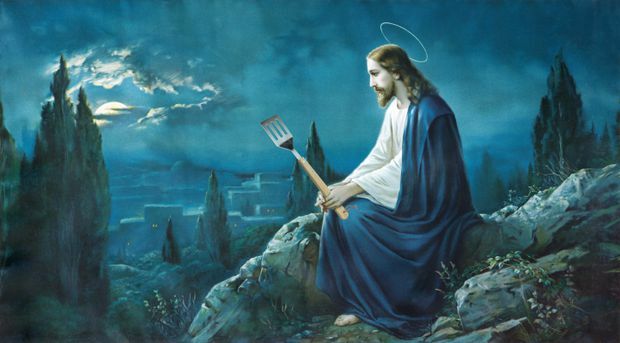 And in the end, I bought a spatula set for $39.99 that I intend to last me until the Second Coming (stain-free rubber handle) – it was neither the least nor the most expensive option, and neither especially self-sacrificing nor especially self-indulgent. As for that other $20 I could have spent, it went to supporting a camp for children from families who don’t have the luxury of thinking biblically about IGEs around the backyard BBQ this summer.